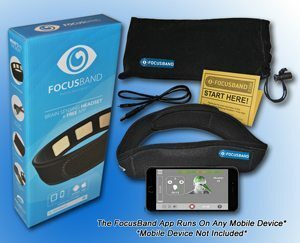 What Is FocusBand Brain Sensing Headset And Free App? The FocusBand Brain Sensing Headset is a wearable brain training device with three sensors that are placed on your head to measure your brain activity. The Bioprene headset & the woven sensors are perspiration tolerant and the measured data is displayed on a mobile for effortless brain training to a calmer state of mind. The FocusBand enables you to self regulate your emotional levels. Emotional stresses can ruin your life unless you take preventive action. It helps you calm your mind & turn off the inner voice in your head, which causes so many problems in today’s hectic society. Now you can draw from the power inside of you and less from outside of you. What Does FocusBand Consist Of? Lightweight neoprene to disperse perspiration. Soft & comfortable so it can be worn for long periods and can be worn while you sleep. Avatar provides audio-visual training validation. Cloud connected for recording and reporting of your own training progress. Games, either solo or against others. Coaches can track the development of students. The FocusBand Neuro-sensors measure and transmit, in real time, your brain’s electrical signals (mind activity). The FocusBand’s algorithms process the electrical signals and audio-visually translate your minds activity via our unique Avatar. This is called neuro-feedback, the best known method for training the brain. To perform to your potential in Sport, Business and Wellness, our research has shown that being able to switch to and execute in the right brain gives you a distinct advantage. The brain is calm and able to make more appropriate decisions in a shorter period of time.